Objective This study aimed to investigate the effect of amiloride on portal hypertension. Amiloride is known to inhibit Na+/H+ exchangers on activated hepatic stellate cells. Methods Liver cirrhosis in rats was induced by bile duct ligation (BDL) or thioacetamide (TAA) administration. The effects of zymosan for Kupffer cell (KC) activation or a thromboxane (TX) analogue (U46619) were tested in isolated perfused livers of cirrhotic rats and in vivo. Downstream mechanisms were investigated using Rho kinase inhibitor (Y-27632) or amiloride. 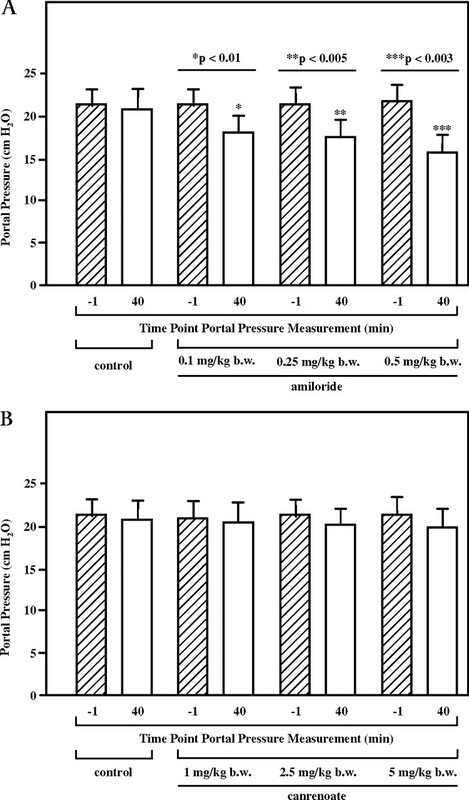 Acute and chronic effects of amiloride and canrenoate on portal pressure were compared in perfused livers and in vivo. TXB2 efflux was measured by ELISA. The phosphorylation state of moesin (p-moesin) as an indicator of Rho kinase activity and expression of the thromboxane synthase were assessed by western blot analyses. The activity of hepatic stellate cells was analysed by western blot and staining for α-smooth muscle actin (α-SMA). Results In BDL rats, KC activation via zymosan increased portal pressure. This was attenuated by the Rho kinase inhibitor Y-27632. Increased thromboxane efflux following zymosan infusion remained unaltered by Y-27632. The infusion of amiloride attenuated zymosan- and U46619-induced increases in portal perfusion pressure. In vivo, direct administration of amiloride, but not of canrenoate, lowered portal pressure. In TAA and BDL rats, treatment with amiloride for 3 days reduced basal portal pressure and KC-induced increases in portal pressure whereas canrenoate had no effect. In livers of amiloride-treated animals, the phosphorylation state of moesin and the number of α-SMA positive cells were reduced. Conclusions Amiloride lowers portal pressure in rat liver cirrhosis by inhibition of intrahepatic vasocontraction. Therefore, patients with cirrhosis and portal hypertension may benefit from amiloride therapy. Several in vivo and in vitro studies, which focussed on the pathomechanisms of fibrogenesis, identified the potential of the Na+/H+ exchanger amiloride to inhibit the activity of hepatic stellate cells.20 21 However, the effects of amiloride or other inhibitors of Na+/H+ exchangers on increased intrahepatic vascular resistance or on portal hypertension in cirrhosis have not been tested. The present study investigated the effects of amiloride on portal pressure in rat liver cirrhosis. All animals were ethically treated according to the criteria of the National Academy of Sciences published by the National Institutes of Health and according to legal requirements in Germany. All animal experiments were approved by the local government (Regierung von Oberbayern, Munich, Germany) and were reported to the responsible authorities every 3 months. Male Sprague–Dawley rats (180–200 g; Charles River, Sulzfeld, Germany) were anaesthetised by intraperitoneal pentobarbital injection (75 mg/kg body weight (b.w.)). After a midline laparotomy was performed, the common bile duct was ligated twice with 3–0 silk and cut between the two ligations.10 19 Sham-operated rats were subjected to laparotomy without bile duct ligation (BDL). Liver perfusion with Krebs–Henseleit buffer and in vivo experiments were performed 4 weeks after the operation, as described below. At this time, the rats had elevated values in liver function tests (alkaline phosphatase, γ-glutamyltransferase, bilirubin, aspartate aminotransferase and alanine aminotransferase, see table 1). Rats were anaesthetised with an intraperitoneal injection of sodium pentobarbital (50 mg/kg b.w.). After incision of the abdominal wall, blood was taken from the inferior vena cava (about 3–4 ml) in order to determine serum parameters. Subsequently, the portal vein was cannulated with an intravenous 14-gauge Teflon catheter, and the liver was perfused at a constant flow rate. The inferior vena cava was cannulated via the right atrium and ligated above the right renal vein. In all experiments, livers were perfused with Krebs–Henseleit solution (pH 7.4, 37°C) in a non-recirculating fashion. The perfusion buffer was gassed with a mixture of 95% O2 and 5% CO2 using an oxygenator.23 Portal perfusion pressure was monitored continuously. The bile duct was cannulated with a polyethylene tube (PE10) to monitor bile flow in both sham-operated and non-operated animals. The liver was allowed to stabilise for 25 min before any substances were added. During this initial 25 min stabilisation period, the criteria for liver viability included stable perfusion pressure and lactate dehydrogenase (LDH) efflux rates < 5 mU/min×g liver. LDH activity was analysed as previously reported.24 If any of the criteria for viability were not satisfied, the sample was discarded. Body weight was determined immediately prior to each experiment. Surgery (4 weeks after BDL or 18 weeks after TAA) was begun after anaesthesia, using an intra-peritoneal injection of sodium pentobarbital (50 mg/kg b.w.). Arterial blood pressure was continuously monitored via a carotid catheter. Laparotomy was performed and a PE tube (23G, 0.6×30 mm) was inserted into the ileocolic vein and advanced to the confluence of the portal vein and splenic vein.10 27 This cannula was used for the simultaneous infusion of zymosan and the registration of portal pressure, as described earlier,10 27 via a transducer system (Sirecust 404; Siemens, Munich, Germany, and Transducer Gabarith from Becton Dickinson, Singapore). This transducer has linearity from <2% or 1 mm Hg and is approved for the clinical use in humans (information from the manual supplied by Becton Dickinson). Four weeks after BDL, a bolus of amiloride (0.25 mg/kg b.w.) was injected into the femoral vein 5 min before intraportal zymosan application (3.2 mg/min, from minute 0 to 6) to investigate the effect of amiloride on KC-dependent increase of portal pressure (n=7). Portal pressure and systemic blood pressure were monitored continuously over the stabilisation period of 10 min and the following 40 min. After the stabilisation period, a bolus of amiloride (0.1 mg/kg b.w., n=4; 0.25 mg/kg b.w., n=4; 0.5 mg/kg b.w., n=4) or canrenoate (1 mg/kg b.w., n=4; 2.5 mg/kg b.w., n=4; 5 mg/kg b.w., n=4) was infused into the femoral vein to delineate the potential of amiloride or canrenoate to lower basal portal pressure. Amiloride (0.1 mg/kg b.w., n=7), canrenoate (5 mg/kg b.w., n=7) or vehicle (water) were applied by subcutaneous injection once a day during the last 3 days of 4 weeks of BDL or 18 weeks of TAA administration (n=7/group). Afterwards, KCs were activated in vivo by zymosan (intraportal application, 3.2 mg/min, from minute 0 to 6). Serum parameters were measured by an Olympus AU2700 analyser (Olympus Germany GmbH, Hamburg), according to standard tests based on the recommendations of the International Federation of Clinical Chemistry (IFCC). The levels of TXB2 (the stable degradation product of TXA2) produced by the livers were quantified by measuring their release into the perfusate. Levels of TXB2 were measured in duplicate using an enzyme immunoassay (Assay Design, Ann Arbour, Michigan, USA). This assay has an intra-assay coefficient of variation of 3.6%, 4.0% and 1.6% and an inter-assay coefficient of variation of 7.6%, 3.6% and 6.2% for low, medium and high values (data from the manual). Furthermore, the test has a cross-reactivity <0.01% for prostaglandin D2, E2, F1α and F2α. Liver tissue was fixed in 4% buffered formalin, dehydrated in graded ethanol and embedded in paraffin by standard methods. Longitudinal sections, 4 μm thick, were stained with H&E (haematoxylin/eosin) and Elastica van Gieson (EvG) according to standard procedures. Immunohistochemistry was performed using an anti-actin antibody (Millipore, Billerica, Massachusetts, USA), dilution 1:300, and the detection system Histofine Simple Stain MAX PO MULTI (Medac, Wesel, Germany) (n=7 per group). The terminal deoxynucleotidyl transferase-mediated deoxyuridine triphosphate nick-end labelling (TUNEL) method was performed using the Apop Tag Peroxidase Detection Kit (Millipore, Schwalbach, Germany) according to the manufacturer's instructions (n=7 per group). To assess the effect of amiloride on Rho kinase activity in BDL and TAA rats, western blot analyses for phospho-moesin (threonine 558) and total moesin were performed according to standard procedures. Additionally, the expression of the thromboxane synthase and the content of α-SMA were measured. Briefly, after SDS-PAGE and blotting, proteins transferred to the membrane were detected by incubation with primary antibodies (anti-phospho-moesin, anti-moesin and anti-α-SMA; Santa Cruz Biotechnology, Santa Cruz, California,USA; and anti-thromboxane synthase; Cayman Chemical, Ann Arbor, Michigan, USA), followed by incubation with a horseradish peroxidase (HRP)-conjugated secondary antibody (Santa Cruz Biotechnology). Bands were visualised using a chemiluminescent detection kit (ECL Plus; Amersham Pharmacia, Uppsala, Sweden). β-Actin was used as an internal control and detected with an appropriate anti-β-actin antibody (Millipore, Billerica, USA). The computed quantitative analyses were performed with ImageJ (NIH, USA). Zymosan, Y-27632, amiloride and canreonate were obtained from Sigma Aldrich (Munich, Germany). Amiloride and canrenoate were handled in the dark as far as possible and dissolved in water. Water was heated to below 50°C to dissolve amiloride; this was not necessary for canrenoate. U46619 was from Cayman Chemical (Ann Arbour, USA) and dissolved in DMSO. All data are expressed as means±SD. Statistical analyses were performed using ANOVA and the Student t test, where appropriate. A p value <0.05 was considered to be statistically significant. Statistical preparation and analyses were performed in collaboration with the Institute for Biometrics and Epidemiology of the University of Munich (IBE, Munich, Germany). All rats had developed ascites and portal hypertension 4 weeks after BDL, as determined by an increase in portal pressure measured in vivo immediately prior to the start of liver perfusion. As expected, spleen weight had also increased in the rats (1.5±0.2 g vs 0.4±0.1 g). In control experiments, portal perfusion pressure was found to be constant during 100 min of liver perfusion (figure 1A). 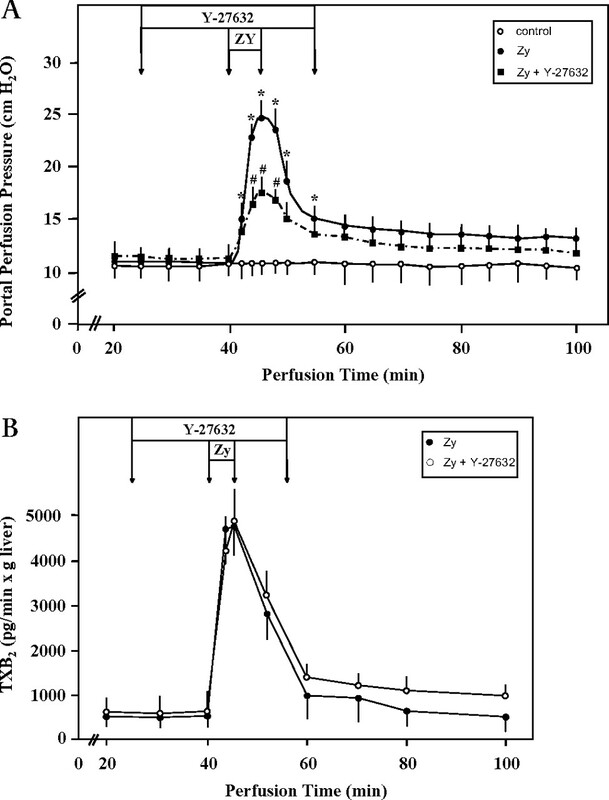 Activation of KCs by zymosan markedly increased portal perfusion pressure from 11.3±1.3 cm H2O to 24.8±1.7 cm H2O (figure 1A). The Rho kinase inhibitor Y-27632 significantly attenuated this zymosan-induced increase of portal perfusion pressure about 60% (figure 1A). Activation of KCs was paralleled by an increased efflux of TXB2, the stable degradation product of TXA2 (figure 1B). The enhanced TXB2 efflux was not altered by Y-27632 (figure 1B). Rho kinase-dependent increase in portal perfusion pressure following Kupffer cell (KC) activation. Data are expressed as mean±SD. (A) KC activation by zymosan A (•, Zy, 150 μg/ml, minute 40 to 46, n=5) 4 weeks after bile duct ligation (BDL) increased portal perfusion pressure (*p<0.05) compared to controls (o, n=5). Additional infusion of Rho kinase inhibitor Y-27632 (■, 10 μmol/l, minute 25 to 55, n=5) attenuated this portal perfusion pressure increase (#p<0.05). (B) The portal perfusion pressure increase by zymosan was parallelled by efflux of thromboxane B2 (•, TXB2, n=5), the stable degradation product of TXA2. Y-27632 (o, 10 μmol/l, minute 25 to 55, n=5) did not alter efflux of TXB2 into perfusate. The zymosan-induced increase of portal perfusion pressure following KC activation was reduced by infusion of amiloride by about 50% (figure 2A) in rats with BDL-induced liver fibrosis. Similar to zymosan, the TX analogue U46619 increased portal perfusion pressure (figure 2A). Again, this increase was attenuated by infusion of amiloride by about 50% (figure 2A). pH was measured in the effluent perfusate, but not affected by infusion of amiloride (data not shown). These effects were confirmed by measurement of portal pressure in vivo. Infusion of amiloride in vivo attenuated the acute portal pressure increase after zymosan-induced KC activation in BDL rats (figure 2B). The infusion of zymosan lowered systemic mean arterial pressure in both groups (table 2). Amiloride attenuates portal perfusion pressure increase. Data are expressed as mean±SD. These experiments were performed 4 weeks after BDL. (A) Liver perfusion experiments. Maximal increase of portal perfusion pressure following zymosan A (150 μg/ml, minute 40 to 46, n=5) was reduced by amiloride infusion (100 μmol/l, minute 25 to 55, n=5). The thromboxane A2 analogue U46619 (0.1 μmol/l, minute 40 to 46, n=5) increased portal perfusion pressure, which was lowered by amiloride infusion (100 μmol/l, minute 25 to 55, n=5, **p<0.0006). (B) In vivo experiments. Bolus infusion of amiloride into the femoral vein (•, 0.25 mg/kg b.w., minute −5, n=5, #p<0.05) attenuated portal pressure increase in vivo following Kupffer cell activation by zymosan (■, Zy intraportal, 3.2 mg/min, minute 0–6, n=7, *p<0.05). Control experiments with a stabilisation period of 10 min and an observation period of 40 min afterwards showed almost no change in portal pressure (▲, n=4). We next assessed the potential of amiloride and canrenoate to lower basal portal pressure of BDL rats in vivo without zymosan challenge. Similar to amiloride, canrenone has been found to block HSC activity. Both canrenoate and spironolactone are prodrugs of the active metabolite canrenone. Amiloride lowered portal pressure at each dose tested (figure 3A). This amiloride-induced decrease of portal pressure was dose-dependent (figure 3A). In contrast, canrenoate affected portal pressure only slightly and at high doses, although this was not statistically significant (figure 3B). Neither systemic mean arterial pressure (table 2) nor heart rate was affected by either compound in any treatment group (data not shown). Dose–response curves for acute effects of amiloride and canrenoate in vivo. Data are expressed as mean±SD. These experiments were performed 4 weeks after bile duct ligation (BDL). (A) Bolus infusion of amiloride in three different doses (minute 0, each n=4) into the femoral vein showed a reduction of portal pressure in vivo after 40 min compared to portal pressure at the end of the stabilisation period in the same animals (minute −1). (B) In contrast, the bolus infusion of canrenoate in three different concentrations (minute 0, each n=4) into the femoral vein showed a slight, but not significant, reduction of portal pressure in vivo after 40 min compared to portal pressure at the end of the stabilisation period (minute −1). Using the animal model of BDL- and TAA-induced cirrhosis, we performed studies to examine the mechanisms underlying the effects of amiloride. All rats had developed the histological picture of liver cirrhosis, elevated values in liver function test (table 1), increased spleen weight (1.5±0.2 vs 0.4±0.1 g) and ascites. In vivo, the basal portal pressure was higher in rats 4 weeks after BDL or with TAA-induced liver cirrhosis than in non-cirrhotic control rats. Amiloride administration for 3 days reduced both basal portal pressure and zymosan-induced maximal portal pressure in BDL and TAA rats by about 30% (figure 4A,B). In contrast to amiloride, the treatment of TAA rats with canrenoate did not affect basal portal pressure or zymosan-induced maximal portal pressure (figure 4A,B). Portal pressure values at the end of the experiments were comparable to initial values (figure 4C). Heart rate (data not shown), systemic mean arterial pressure (table 2) and grade of cirrhosis (data not shown) were not affected by treatment with amiloride or canrenoate. 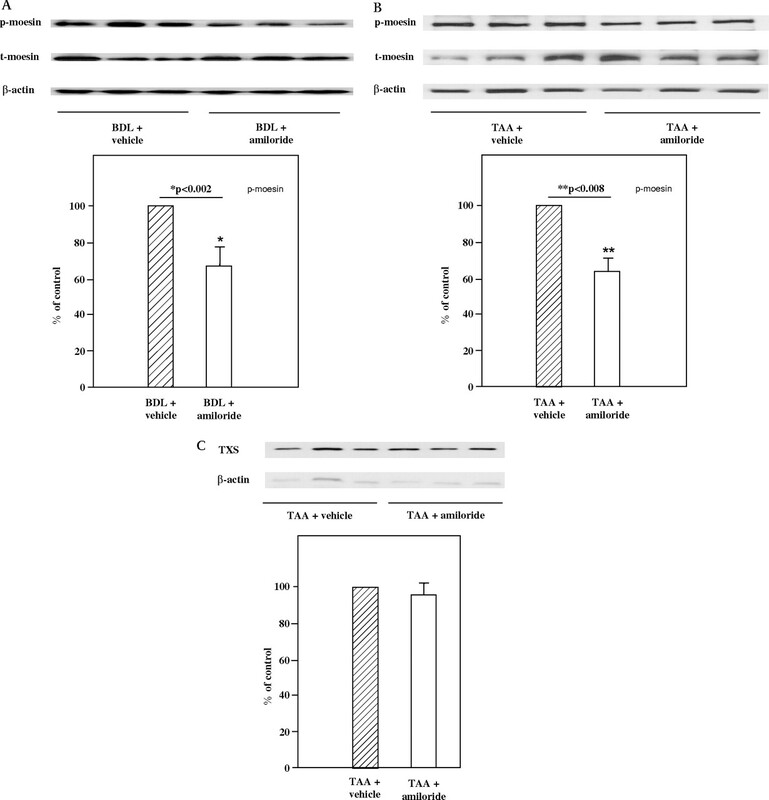 Western blot analyses showed a reduced content of phosphorylated moesin (p-moesin) in livers of amiloride-treated BDL and TAA rats compared to livers of vehicle-treated BDL or TAA rats, while the content of total moesin (t-moesin) was not affected (figure 5A,B). This observation was confirmed by quantification of western blots (figure 5A,B). In contrast, the expression of thromboxane synthase was not influenced by amiloride treatment (figure 5C) in TAA-induced cirrhosis. To evaluate the effect of amiloride treatment on activity of the hepatic stellate cells, immunohistological stainings of α-SMA were performed (figure 6A). 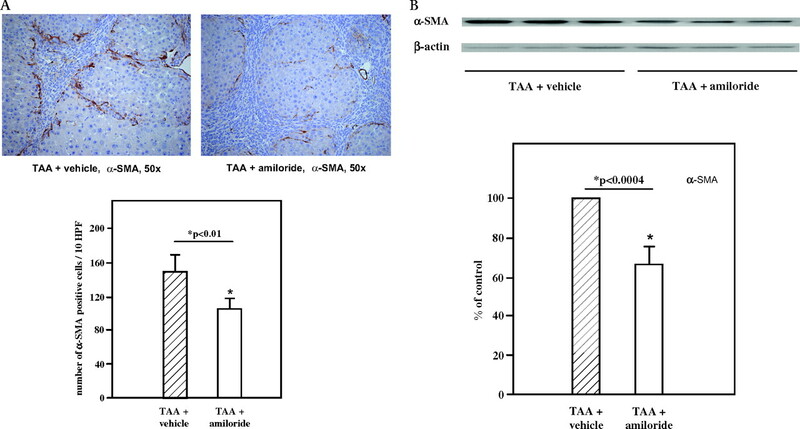 Analysis of these stainings showed a decrease in the number of α-SMA positive cells in the amiloride-treated group of TAA rats compared to the group of TAA rats with vehicle administration (figure 6A). These findings were substantiated by western blot analyses which showed a reduced content of α-SMA following amiloride treatment (figure 6B). To investigate whether processes of apoptosis were involved in the reduction of the α-SMA positive cells, a TUNEL assay has been performed. The analysis of this staining demonstrated that there was no difference in the number of apoptotic cells between vehicle-treated and amiloride-treated animals (figure 7). Amiloride but not canrenoate treatment for 3 days reduced portal pressure in vivo. Data are expressed as mean±SD. Amiloride (0.1 mg/kg b.w., n=7 per group), canrenoate (5 mg/kg b.w., n=7 per group) or the vehicle for both (water, n=7 per group) was given subcutaneously during the last 3 days of bile duct ligation (BDL) for 4 weeks or thioacetamide (TAA) administration period of 18 weeks. (A) Basal portal pressure (minute −5) was much higher in BDL and TAA animals than in control animals (*p<0.0001) and was reduced by amiloride pre-treatment (+p<0.006, #p<0.005) compared to animals treated with the vehicle. In contrast, canrenoate pre-treatment did not alter portal pressure in vivo in TAA animals. 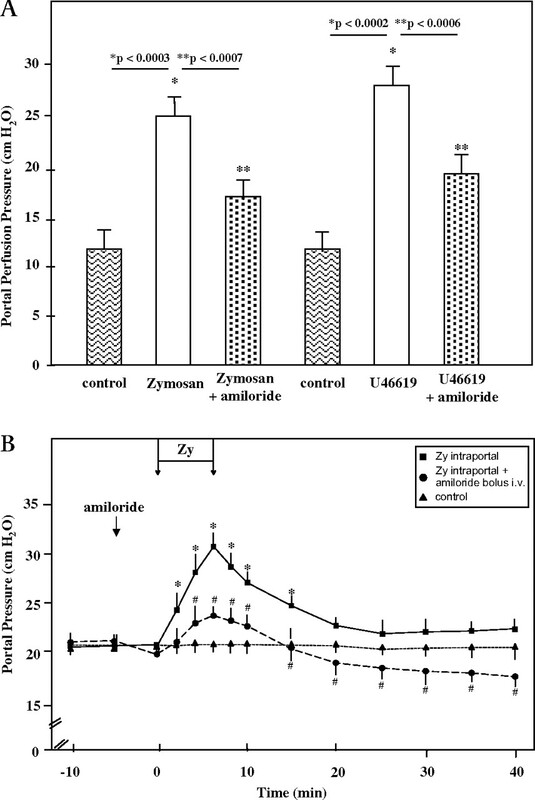 (B) Maximal portal pressure following Kupffer cell activation by zymosan (Zy intraportal, 3.2 mg/min, minute 0–6, ++p<0.002, ##p<0.004) was attenuated by amiloride pre-treatment in comparison to the vehicle group. Canrenoate did not alter maximal portal pressure. (C) At the end of the experiments (minute 40), portal pressure decreased to close to initial values (minute −5) and was still reduced in the amiloride pre-treatment group. Hepatic phospho-moesin levels and thromboxane synthase expression. (A and B) Effects of amiloride on contractile cells. Phosphorylation of moesin reflects the activity of contraction-mediating Rho kinase in cells such as hepatic stellate cells and myofibroblasts. Treatment of BDL or TAA rats with amiloride for 3 days resulted in decreased hepatic phospho-moesin levels (*p<0.002, **p<0.008), reflecting reduced activity of Rho kinase in the intrahepatic vasculature. Shown are representative western blots and quantification of all experiments (mean±SD, n=7 per group). (C) Effects of amiloride on thromboxane synthase expression. The major hepatic cell type expressing thromboxane synthase are Kupffer cells. Treatment of TAA rats with amiloride for 3 days was without effect on hepatic expression of thromboxane synthase. Shown are representative western blots and quantification of all experiments (mean±SD, n=7 per group). Immunohistochemical staining and western blot analyses of liver sections for α-smooth muscle actin (α-SMA). (A) Liver sections of solvent- and amiloride-treated thioacetamide (TAA) rats were stained for α-SMA. Treatment of TAA rats with amiloride for 3 days resulted in reduced α-SMA-positive cells. Shown are representative microscopic pictures from solvent- and amiloride-treated TAA rats, and quantification of all stained sections (n=7 per group). (B) These findings were confirmed by western blot analyses which showed a reduced content of α-SMA in amiloride-treated animals (n=7 per group). TUNEL assay for detection of apoptotic cells. TUNEL assay was performed as indicated and showed no difference in apoptotic cells for vehicle- or amiloride-treated cells. Shown are representative microscopic pictures from solvent- and amiloride-treated TAA rats, and quantification of all stained sections (n=7 per group). This study describes the effects and underlying mechanisms of amiloride on portal hypertension in different animal models of cirrhosis. We observed a reduction in intrahepatic vascular resistance and portal pressure by amiloride. Although amiloride can be applied for the treatment of cirrhosis, the current study is, to our knowledge, the first investigation of the effects of amiloride on portal hypertension. Most important among our findings were that (1) KC activation increased the portal pressure via TXA2 and the consecutive intrahepatic vasoconstriction by Rho kinase; (2) blockade of hepatic stellate cells by amiloride lowered portal pressure dose-dependently and was more effective than canrenoate; and (3) amiloride reduced both basal portal pressure and acute KC-dependent portal pressure increases in rat liver cirrhosis These results were obtained using in situ perfused livers and confirmed by in vivo studies in two different animal models of cirrhosis. The diagnosis of cirrhosis in the BDL and TAA rats was made based on serum parameters, the presence of ascites, changes in liver histology and elevated portal pressure in vivo. Our initial set of experiments demonstrated that the activation of KCs by infusion of zymosan increased portal perfusion pressure in livers 4 weeks after BDL. This confirmed findings in our previous studies.10 Interestingly, the addition of the Rho kinase inhibitor Y-27632 prevented this KC-dependent increase in portal perfusion pressure. Rho kinase has been described as an important mediator of vasoconstriction in hepatic stellate cells and intrahepatic myofibroblasts.15 19 Kupffer cell activation resulted in thromboxane production, which was not influenced by the Rho kinase inhibitor, while portal pressure was significantly reduced by the Rho kinase inhibitor. Indeed, Rho kinase in intrahepatic microvasculature may represent an attractive target for therapies of portal hypertension. Infusion of a Rho kinase inhibitor results in dramatic decreases of mean arterial pressure and systemic vascular resistance15 18. Therefore, alternatives to block intrahepatic vasoconstriction are needed. Amiloride is routinely used as a diuretic and has been shown to prevent fibrogenesis effectively in vitro and in vivo.20 The in vitro data suggest that amiloride inhibited activation of the Na+/H+ exchanger on isolated hepatic stellate cells. Besides fibrogenesis, activated hepatic stellate cells mediate contraction of the intrahepatic vasculature. We therefore tested the hypothesis that amiloride attenuates intrahepatic vascular resistance and portal pressure due to decreased HSC contraction in intrahepatic microvasculature by KC-derived vasoconstrictors. Indeed, amiloride attenuated increases of portal perfusion pressure following direct KC activation by zymosan or administration of the thromboxane analogue U46619. We assume that the effects of amiloride in our study can be attributed to the inhibition of Na+/H+ exchangers, because unspecific actions (eg, inhibition of the adrenergic system) require higher doses than used here.28 Furthermore, pH remained unchanged in effluent perfusate following amiloride infusion during in situ liver perfusion, although amiloride is an inhibitor of the Na+/H+ channel. Therefore, observed effects cannot be ascribed to alterations in intrahepatic pH, and induced changes of pH were probably balanced by other mechanisms. These effects of amiloride on acute portal perfusion pressure increases were also investigated in vivo, where we determined that infusion of amiloride lowered the zymosan-induced increase of portal pressure. However, the infusion of zymosan resulted in a dramatic decrease in mean arterial blood pressure. This effect can be deduced to a general activation of macrophages in the body. The activation of macrophages, for example via TLR2 and TLR4 in the whole body, leads to a sepsis-like syndrome which has been described earlier.10 Although the blood pressure decreased, the portal pressure still increased. Altogether, the in vivo experiments supported data obtained from isolated perfused livers. It has been described that canrenone, the active metabolite of canrenoate and spironolactone, may inhibit the activity of hepatic stellate cells21 and lower portal pressure.29 30 Therefore, we compared dose-dependent effects of canrenoate and amiloride on portal pressure in vivo. Three different doses were tested for each drug: a dose over the upper limit for therapeutic administration in humans (amiloride 0.5 mg/kg b.w., canrenoate 5 mg/kg b.w. ), a high but feasible dose for treatment in humans (amiloride 0.25 mg/kg b.w., canrenoate 2.5 mg/kg b.w.) and a generally recommended dose for diuretic treatment in humans (amiloride 0.1 mg/kg b.w., canrenoate 1 mg/kg b.w.). Amiloride reduced portal pressure at all doses. In contrast, portal pressure decreased only slightly but not significantly by the administration of canrenoate at any dose. A short-term treatment over 3 days confirmed the data of the dose response curve. The amiloride treatment over 3 days lowered both the basal and maximal portal pressure in vivo following KC activation, but canrenoate altered neither basal nor maximal portal pressure. This is, to our knowledge, the first time that the effects of canrenoate and amiloride on portal pressure have been tested in a model of bile duct ligation or of TAA-induced cirrhosis. The effects of amiloride occurred in both animal models and seemed, therefore, to be independent of the aetiology of the underlying experimental liver disease. In addition to our functional experiments, we performed investigations at a molecular level to identify mechanisms that may underlie the reduction of intrahepatic vascular resistance by amiloride. Due to the treatment period of 3 days, any antifibrotic effects expected in long-term treatment21 may be excluded in the present study. This was confirmed by Elastica van Giesson staining showing no effect on the extent of fibrosis. The western blot analyses showed that the content of phosphorylated moesin was reduced by amiloride treatment, while the expression of total moesin was not altered. This indicates a decrease of Rho kinase activity by amiloride. Therefore, we speculated that the decrease of intrahepatic vascular resistance in response to amiloride is related to reduced activation of contraction-mediating Rho kinase in cells of intrahepatic microvasculature. To further investigate involvement of the hepatic stellate cells, we performed immunohistochemical stainings of liver sections for α-SMA. This is widely used as marker for activated hepatic stellate cells.31–34 The staining for α-SMA indicated a reduced number of activated hepatic stellate cells in the cirrhotic livers after treatment with amiloride. Western blot analyses confirmed that there was a decrease in the α-SMA content by amiloride pre-treatment. However, the TUNEL assay showed no difference for apoptotic cells in vehicle- and amiloride-treated animals. Therefore the reduced α-SMA content in this experimental setting rather suggests a reduced activity status of the cells with contractile elements. The expression of the thromboxane synthase was not altered by amiloride treatment. In the liver, thromboxane synthase is mainly expressed by KCs.10 12 35–37 This suggests that amiloride reduced intrahepatic vascular resistance via an HSC-dependent mechanism. In addition other mechanisms seem possible. A decreased contraction of myofibroblasts surrounding vascular shunts in cirrhotic septa could be involved in amiloride-induced portal pressure decreases. Major changes in the plasma volume can be excluded due to an almost unaltered mean arterial blood pressure although minor alterations of the plasma volume are feasible. The cardiac output was not measured in these experiments, so that an effect of amiloride on the portal inflow can not be excluded. However, a short treatment period of 3 days or acute application was sufficient to reduce intrahepatic vascular resistance and portal pressure by actions on intrahepatic vasoconstrictor-responsiveness, but without antifibrotic effects. In the present study, amiloride was administered subcutaneously and intravenously. In clinical practice, amiloride is taken orally. After oral application, amiloride is absorbed in the gut by about 50–70%, but accumulates by repeated doses. Therefore we would expect that the effect is still clear when amiloride is administered orally. In conclusion, amiloride is effective in lowering portal pressure while canrenoate had limited potential to lower portal pressure in rat liver cirrhosis. This suggests that amiloride may benefit patients with liver cirrhosis and portal hypertension by lowering portal pressure, in addition to its diuretic effect. Amiloride is well known as a diuretic treatment option for heart diseases and for patients with liver cirrhosis. In addition, it has been described in an experimental study that amiloride has antifibrogenic effects via blockade of the Na+/H+ channel on hepatic stellate cells. The present study showed that amiloride reduced portal pressure via attenuation of intrahepatic vasoconstrictor responsiveness. If this effect could be confirmed by a clinical study, patients with liver cirrhosis and portal hypertension may benefit from amiloride by lowering portal pressure, in addition to its diuretic effect. The authors would like to thank Ingrid Liss and Christoph v. Hesler for their excellent technical assistance. We would like to thank Peter Dirschedl for his support in statistical preparation and analysis of this work. This study is part of the thesis of Christina Hartmann.
. Prognosis in patients with cirrhosis and mild portal hypertension. Scand J Gastroenterol 2006;41:1446–53.
. The hemodynamic response to medical treatment of portal hypertension as a predictor of clinical effectiveness in the primary prophylaxis of variceal bleeding in cirrhosis. Hepatology 2000;32:930–4.
. Treatment of acute variceal bleeding. Dig Liver Dis 2008;40:328–36.
. The extent of the collateral circulation influences the postprandial increase in portal pressure in patients with cirrhosis. Gut 2007;56:259–64.
. Fibrosis and cirrhosis reversibility: clinical features and implications. Clin Liver Dis 2008;12:901–13, x.
. Coagulation and fibrosis in chronic liver disease. Gut 2008;57:1722–7.
. Angiogenesis in liver disease. J Hepatol 2009;50:604–20.
. Endothelin and vascular function in liver disease. Gut 2004;53:159–61.
. Sinusoidal endothelial COX-1-derived prostanoids modulate the hepatic vascular tone of cirrhotic rat livers. Am J Physiol Gastrointest Liver Physiol 2005;288:G763–70.
. Kupffer cell activation in normal and fibrotic livers increases portal pressure via thromboxane A2. J Hepatol 2007;47:228–38.
. The paradox of nitric oxide in cirrhosis and portal hypertension: too much, not enough. Hepatology 2002;35:478–91.
. LPS exacerbates endothelin-1 induced activation of cytosolic phospholipase A2 and thromboxane A2 production from Kupffer cells of the prefibrotic rat liver. J Hepatol 2007;46:276–85.
. Decreased intrahepatic response to alpha1-adrenergic agonists in lipopolysaccharide-treated rats is located in the sinusoidal area and depends on kupffer cell function. J Gastroenterol Hepatol 2007;22:893–900.
. Signaling pathways in liver diseases: kupffer cells. In: Dufour J-F, Clavien P-A, eds. Signaling pathways in liver diseases. Heidelberg: Springer Verlag, 2009.
. Intrahepatic upregulation of RhoA and Rho-kinase signalling contributes to increased hepatic vascular resistance in rats with secondary biliary cirrhosis. Gut 2006;55:1296–305.
. Mechanisms of extrahepatic vasodilation in portal hypertension. Gut 2008;57:1300–14.
. Atorvastatin lowers portal pressure in cirrhotic rats by inhibition of RhoA/Rho-kinase and activation of endothelial nitric oxide synthase. Hepatology 2007;46:242–53.
. Defective RhoA/Rho-kinase signaling contributes to vascular hypocontractility and vasodilation in cirrhotic rats. Gastroenterology 2006;130:838–54.
. Sorafenib targets dysregulated Rho kinase expression and portal hypertension in rats with secondary biliary cirrhosis. Br J Pharmacol 2009;157:258–70.
. Inhibition of the Na(+)/H(+) exchanger reduces rat hepatic stellate cell activity and liver fibrosis: an in vitro and in vivo study. Gastroenterology 2001;120:545–56.
. Antifibrogenic effects of canrenone, an antialdosteronic drug, on human hepatic stellate cells. Gastroenterology 2003;124:504–20.
. A stable model of cirrhotic portal hypertension in the rat: thioacetamide revisited. Eur J Clin Invest 2006;36:242–9.
. Glutathione protects the rat liver against reperfusion injury after hypothermic preservation. Gastroenterology 1999;117:200–10.
. Glutathione treatment protects the rat liver against injury after warm ischemia and Kupffer cell activation. Digestion 2002;66:49–57.
. Induction of cellular resistance against Kupffer cell-derived oxidant stress: a novel concept of hepatoprotection by ischemic preconditioning. Hepatology 2003;37:286–95.
. Vascular dysfunction in human and rat cirrhosis: role of receptor-desensitizing and calcium-sensitizing proteins. Hepatology 2007;45:495–506.
. Intraportal administration of glyceryl trinitrate or nitroprusside exerts more systemic than intrahepatic effects in anaesthetised cirrhotic rats. J Hepatol 1999;31:300–5.
. Alpha-adrenoceptor antagonistic action of amiloride. Biochem Pharmacol 1987;36:3509–15.
. Effects of simvastatin, pentoxifylline and spironolactone on hepatic fibrosis and portal hypertension in rats with bile duct ligation. J Hepatol 1997;26:1363–71.
. Effects of varying doses of spironolactone without and with nitrates on portal vein pressure and kidney function in partial portal vein ligated rats. Hepatology 1996;24:1492–6.
. Mesenchymal origin of hepatic stellate cells, submesothelial cells, and perivascular mesenchymal cells during mouse liver development. Hepatology 2009;49:998–1011.
. Hepatic stellate cell/myofibroblast subpopulations in fibrotic human and rat livers. J Hepatol 2002;36:200–9.
. Beauty is in the eye of the beholder: emerging concepts and pitfalls in hepatic stellate cell research. J Hepatol 2002;37:527–35.
. Role of hepatic stellate cell/hepatocyte interaction and activation of hepatic stellate cells in the early phase of liver regeneration in the rat. 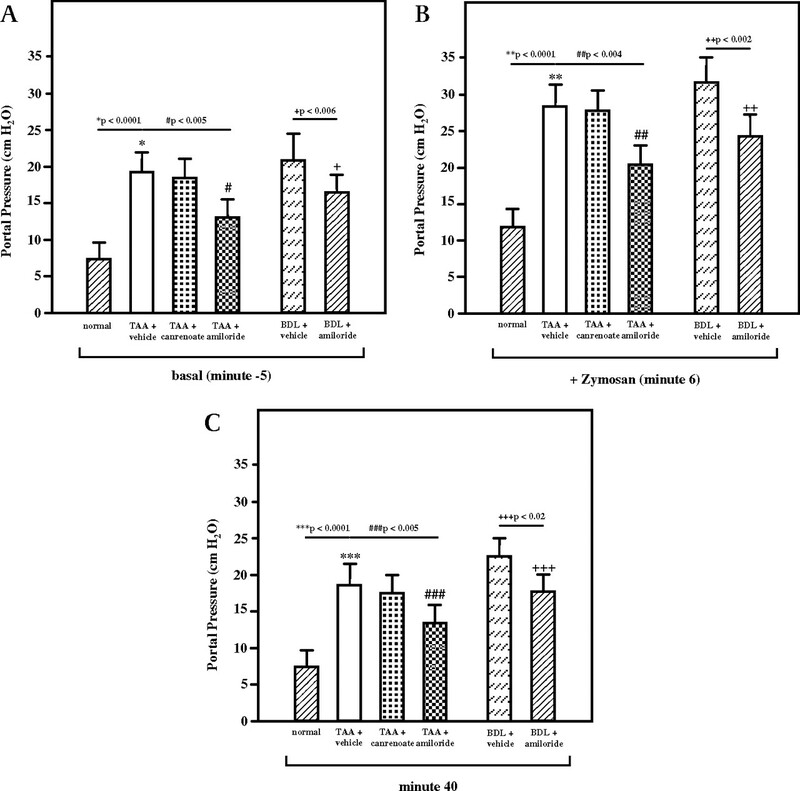 J Hepatol 2004;40:910–16.
. Alterations in thromboxane synthase and thromboxane A2 receptors in experimental alcoholic liver disease. J Pharmacol Exp Ther 1997;282:1037–43.
. Role of thromboxane in producing hepatic injury during hepatic stress. Arch Surg 2005;140:801–7.
. Role of Kupffer cells in host defense and liver disease. Liver Int 2006;26:1175–86.
. Randomized clinical study of the efficacy of amiloride and potassium canrenoate in nonazotemic cirrhotic patients with ascites. Hepatology 1994;19:72–9.
. The management of ascites in cirrhosis: report on the consensus conference of the international ascites club. Hepatology 2003;38:258–66.
. Chronic splanchnic hemodynamic effects of spironolactone with unrestricted sodium diet in patients with compensated cirrhosis. Dig Dis Sci 1998;43:893–7.
. Effect of potassium canrenoate, an anti-aldosterone agent, on incidence of ascites and variceal progression in cirrhosis. Clin Gastroenterol Hepatol 2006;4:1395–402.
. [Spironolactone in the treatment of portal hypertension in liver cirrhosis. A new therapeutic principle?]. Dtsch Med Wochenschr 1985;110:1774–6.
. Nadolol plus spironolactone in the prophylaxis of first variceal bleed in nonascitic cirrhotic patients: a preliminary study. Hepatology 2003;37:359–65. Funding This study was supported by grants from the Faculty of Medicine, University of Munich (MolMed and LebMit) and by the Deutsche Forschungsgemeinschaft (DFG, STE 1022/2-1). Ethics approval All animal experiments were approved by the local government, Regierung von Oberbayern, Munich, Germany.